Chelsea boss Jose Mourinho will contest a Football Association charge of misconduct related to comments he made "congratulating" referee Mike Dean after the Blues' defeat by Sunderland. Mourinho, 51, has requested a non-personal hearing of his case. Assistant coach Rui Faria, who was sent to the stand as he tried to confront Dean, has admitted misconduct. Mourinho described Dean's performance as "unbelievable" and "fantastic" after then-bottom side Sunderland won 2-1. The Portuguese also seemed to suggest that his side had been continually disadvantaged in the race for the Premier League title by officials' decisions as he commented on Mike Riley, the head of refereeing body Professional Game Match Officials Limited. "Congratulations to Mike Riley, because he's the referees' boss," he added. "What they are doing during the whole season is fantastic, especially in the last couple of months, especially in matches involving the teams that were in the title race - it's absolutely fantastic." Mourinho has been sent off twice this season - away to Aston Villa in March and at home to Cardiff in October - incurring £8,000 fines on each occasion. The former Real Madrid boss has been uncharacteristically subdued in most of his news conferences since his latest charges. 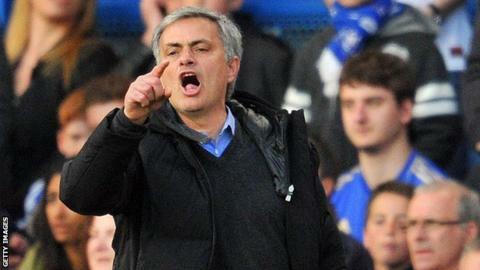 "Every time I speak there is a consequence," Mourinho said on Friday. "Even if I say that a referee was amazing that was a reason to be charged. "I can't say the truth. I don't feel free at all. If you want a better press conference, speak with the FA." Midfielder Ramires has been given a four-game ban for elbowing Sebastian Larsson during the defeat which marked the end of Mourinho's run of 77 matches unbeaten at home in the Premier League. Although he has admitted misconduct, Faria has also requested a non-personal hearing.